The Manefay landslide at the Bingham Canyon openpit copper mine on April 11, 2013. This view, toward the northeast, shows the landslide in its entirety with the main failure plane angling downward from the right side of the headwall scarp toward the buildings in the middle left. The slip plane is in the Manefay series beds of the Bingham Mine Formation. Also notable are the two different slides—the earlier lightgray slide of pyritized Bingham Mine Formation quartz sandstones overlain by the yellow-brown, oxidized dump material which slid about 1.5 hours later. Also apparent is the fluidity of the slide as shown by the layering in the foot of the deposit in the pit bottom. Multiple pieces of mining equipment caught up in the slide are barely visible at the toe of the slide in the lower left. Photo courtesy of Kennecott Utah Copper. On April 10, 2013, two massive landslides carried about 145 million tons of waste rock into the bottom of the open pit at Bingham Canyon, the largest copper mine in the U.S. These are the largest mining-induced landslides in history. The two slides, named the Manefay landslides by Kennecott Utah Copper (KUC), started in the northeast corner of the open pit—the first at 9:30 p.m. was larger (nearly 100 million tons), and the second followed a little over an hour and a half later. The second slide was followed 11 minutes later by a small, shallow earthquake (about magnitude 2.5) beneath the mine, induced by the rapid shifting weight of the slides. Notably, the Manefay slides resulted in no injuries or deaths, but they significantly changed the face of the mine and caused hundreds of millions of dollars of damage to the operation. Fortunately, KUC was prepared and had a sophisticated network of geotechnical monitors in place at the mine. These monitors showed instability in the area of the slide beginning in November 2012, but becoming more threatening in early 2013. The area of the slide showed increasing movement, and when it reached a rate of about 2 inches per day on April 10 all employees were evacuated from the mine at 11 a.m. and a press release was issued at 2:38 p.m. warning that a slide was imminent. Despite these efforts, the slides resulted in significant damage to both the mine’s fixed infrastructure, including the main haul road, and somewhat surprisingly, to its fleet of mobile equipment, which had been moved to the far side of the pit. Damage to the fleet included 3 of the 13 shovels, 14 of the 100 haul trucks, and some other ancillary equipment including drills, bulldozers, and graders (haul trucks cost approximately $5 million and shovels about $45 million each). Some of the equipment was recovered, repaired, and returned to service, but most was a total loss. The headwall of Bingham’s Manefay slides was 1,150 feet high, and the slide was 9,840 feet long with a total drop of about 2,975 feet. The slides failed mainly along the Manefay series beds at the base of the Upper Pennsylvanian Bingham Mine Formation that dipped moderately northwest into the pit. The slide was somewhat larger than KUC anticipated, but more importantly, instead of acting like a rockfall or slump as previous small pit-wall failures had, this slide acted more fluidly and is properly termed a rock avalanche. This fluidity resulted in the slide reaching speeds in excess of 70 mph and advancing considerably farther to the southwest across the pit bottom than anticipated, resulting in the damage to the equipment. Initial work after the slides consisted of assessing the situation and developing a plan to stabilize the headwall of the slide so that it would be safe to work below. Because the in-pit crusher and underground ore conveyor were not damaged, ore production resumed just 17 days after the slide. The other priority was to re-establish the main haul road into the pit. The new haul road is about ¾ mile long, 150 feet wide, and required the removal of about 6 million tons of landslide debris. The road was completed in just 7 months, largely as a result of the rapid innovative development and implementation of over 20 pieces of remote-controlled heavy equipment in areas that were still not safe for employees to work. Remarkably, Bingham continued to produce moderate amounts of ore following the slides in 2013 and 2014, but in 2015 a reappraisal of the overall stability of the east side of the open pit mandated a massive waste rock stripping (removal) program to reduce the pit slopes and the risk of future landslides. This required nearly all of the mine equipment to be used in this waste stripping operation, resulting in little new ore production and the highest stripping ratio (5:1 waste:ore) in the 110- year history of Bingham’s open-pit mining operations. 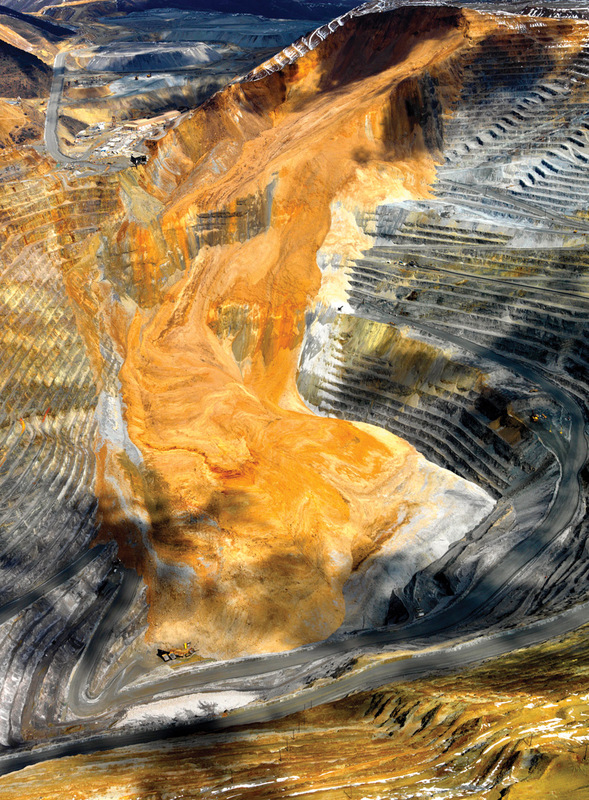 Consequently, most of the material processed through the Copperton concentrator in 2015 was from a large, low-grade stockpile of previously mined material. Copper production from this low-grade material reduced the mine’s output in 2015 by nearly 55 percent from the already modest 2014 production. This made Bingham’s 2015 production the lowest since the mine was closed in 1986 due to low metal prices. Despite these considerable difficulties, Bingham still realized a slight profit in 2015. Moving forward, there is another year of stripping planned for safety’s sake on the east side of the pit along with gradually increasing copper production. After this, Bingham will still have about 700 million tons of ore primarily hosted in and under the south wall of the pit. Mining this reserve will push the south wall of the pit about 1,000 feet farther south and the bottom of the pit 300 feet deeper. This gives the mine a remaining life of 13 years, through 2028, with improved copper and molybdenum grades, which should return Bingham to the position of one of the largest annual copper and molybdenum producers in the U.S. by 2018. For more detailed information on the Manefay slides please see: Pankow, K.L., Moore, J.R., Hale, J.M., Koper, K.D., Kubacki, T., Whidden, K.M., and McCarter, M.K., 2014, Geological Society of America GSA Today, v. 24, no. 1, p. 4–9.